[GF] Contains no gluten ingredients. [U] Kosher certified. NON GMO project verified. My husband returned from a business trip today. He brought back lightly salted peanuts from thepeanutshop.com. Best peanuts I've had in my life bar none! Cannot stop eating them!!! In my 60 years I have never seen or tasted peanuts this good. This can was given to me as a Xmas gift and was a pleasant surprise. I have been eating Peanuts pretty much every day for as long as I can remember. A true addict. These are simply the absolute BEST that there is. The crunch is like no other! The flavor lets you know right there and then that you are eating the best there is. These are just fantastic. It must be a genetic predisposition, as I have now introduced my son to these and the addiction continues! These lofty legumes, these notable nuggets, are proof that Mother Nature is no longer angry at us humans for switching her real butter with margarine, and is welcoming us into her loving tendrils again with these terra-drops of deliciousness. In other words, these are some pretty dang good nuts! Do yourself a favor and get many. 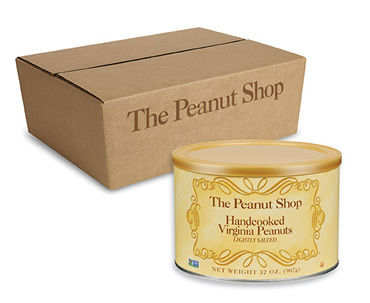 The lightly salted Virginia Peanuts are just magnificent! The major problem for me however is the fact that they are addictive and it is extremely trying for me to quit devouring every peanut until the tin is empty. Please help! Thank you! I just recently tried these peanuts. They were excellent, not too greasy or salty, just right. I would definitely recommend them for holiday gifts. Best peanuts I ever had! I am a big time nut lover and these are without a shred of doubt the best peanuts I have ever had. We vacationed in Virginia last summer. We had never heard of Virginia Peanuts. While in Colonial Williamsburg we stopped in The Peanut Shop. Amazing Peanuts!I have always loved peanuts but never tasted any that were so crunchy and delicious! I won't ever enjoy any other kind of peanuts again except Virginia Peanuts! I'm addicted! If you've never tried them you are missing out! Unique peanuts that make an everlasting statement! Once you try them they are all you will ever eat! These are, without a doubt, the absolute best peanuts you will ever eat! We always keep at least 3 cans in the pantry, and if we were not careful, could easily go through a 2-pound canister in less than a week! Peanut bliss!!! My wife is from VA, I was hooked on these twenty five years ago. We have ordered from several companies but these are the best. Can't wait until the fall for the chocolate covered. They are a seasonal thing. I just ate the last of these that I purchased on a recent visit to the Williamsburg shop. I MUST HAVE MORE! I've been ordering them for some years, and it was awesome to finally visit the shop, but you've ruined me! I just can't eat regular old boring canned or jarred peanuts from the local grocers anymore. I HAVE TO HAVE Fresh VA Peanuts! Time to order some more, I suppose, since I won't likely be in VA again until December. I dare not show up for family holidays and company meetings without these peanuts -- they are a true food, not a snack, and once folks know about them, there's no going back. I'm a Canadian who discovered these peanuts while visiting Williamsburg. I thought I knew the true taste of peanuts UNTIL I munched on my first palm-full of your Virginia Peanuts. I now order them regularly. I'm close to being an addict! These really are the best! Crispy, large and done to perfection. superior product. 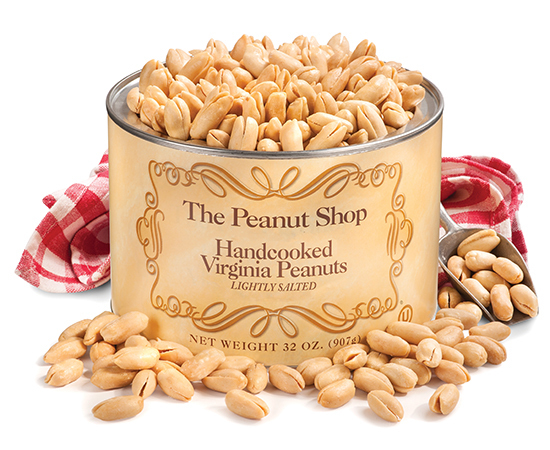 Hand cooked VA Peanuts-Lightly Salted. My sister send me a can every Christmas. I've been buying these ever since we went to Williamsburd 15 years ago.We buy them by the case. They are the best. My Husband can't get enough. So they may be higher on line rather than going to Total Wine or BJ's. When you order them on line, they bring 'em right to you, free shipping. In fact, I was mowing my back yard this evening , and my regular UPS guy brought them around to me, not wanting to leave them by the front door, thank you! And I didn't have to waste gas going to purchase them. Sitting here eating them right now. Got peanuts as a gift last Christmas from a vendor. Oh, how I love these peanuts! They don't compare the "name" brand from the grocer. We are making trail mix with these and love them. I need a 50 lb. sack! Fantastic peanuts. We buy two containers at a time; 1 lightly salted and 1 without salt and mix the two. These are great peanuts no matter which ones you get. No salt are great for folks on a low salt diet. Delicious! Received the peanuts as a gift. What a treat. I'm hooked!! You get what you pay for... the BEST ever! If you want to redefine 'peanut' try these. Simply the best, ever and worth every penny. I received these peanuts as a xmas gift last year. I was blown out of the water what a great peanut with a hint of salt. Love love love my peanuts. Simple recipe with quality ingredients. Fresh, dependable, always delicious. The best peanuts I have ever had. Consider me a lifetime customer. I agree with Joe. These are the best peanuts I have ever had. However. please explain why the liquor/wine shop in DE sells them for $10 compared to your $21. Tasty,Crunchy, and best peanuts I ever ate. Love the nuts, but how is it that I can buy a 20oz can at Total Wines for under $10 and The Peanut Shop charges $20? These are absolutely the best peanuts. So good they have become an eagerly anticipated annual holiday gift among family.